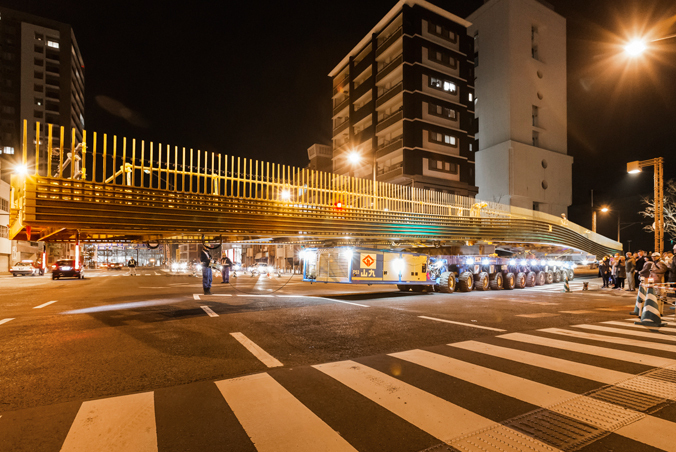 Maximum precision was required as Sankyu, a long-standing customer of the TII Group and highly experienced mover of sensitive loads, recently transported a 40-metre long bridge weighing 50 tonnes through the densely-built downtown area of the Japanese city of Nagasaki. On 12 SCHEUERLE SPMT axle lines, the bridge was moved to the canal separating the historic Dejima Island from the city. During the Edo period (1603 to 1868), the artificial island served as the only place where direct trade and exchange between Europe and Japan could take place. Due to ongoing land reclamation in the 19th century, the island gradually became part of Nagasaki city centre and became hardly recognizable. Today, many buildings have been reconstructed using old plans and models.